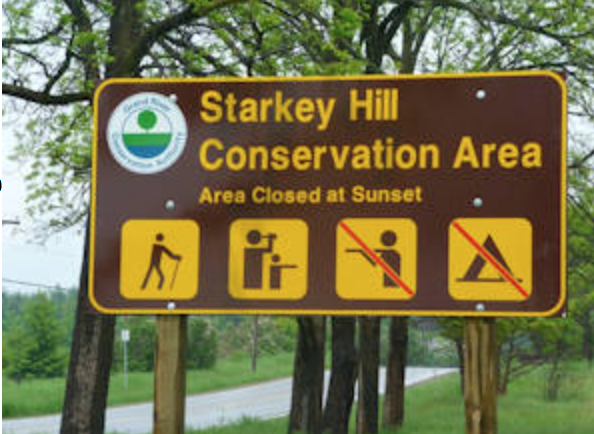 The Starkey Hill Interpretive Trail is jointly managed by the Guelph Hiking Trail Club and the Grand River Conservation Authority. As you hike this trail, you will see steep forested slopes, wetlands and many other features that make this a beautiful and environmentally important place. Numbered markers along the path will help you enjoy the highlights of the trail. Click here to view the map. The property has a beautiful hardwood forest, and a large percentage of the area is pine plantation. Regeneration within the pines is slowly taking place and new growth is beginning to become evident. While on the high parts of the trail take a moment to enjoy the views and the landscape before you. The geological history of the Starkey property is an excellent example of the area's moraines and kettle depressions that are remnants of the ice age that swept this area 10,000 years ago. While walking the property take a moment to think of what it was like when the Starkey family first arrived in 1849. In June of 1972, the Grand River Conservation Authority (GRCA) bought the property on behalf of the City of Guelph for protection of the underlying groundwater. Guelph draws most of its drinking water from groundwater wells, the strongest concentration of which lies in the Arkell area. In the spring of 1972, the GRCA reforested 91 acres (36.86 hectares) with white pine. Today, many of these pines have matured and management practices are in place. In 1973, the Guelph Hiking Trail Club established a trail through the Starkey property. Mr. John Starkey was 11 years old when his family settled in Puslinch Township from the United States in 1833. In 1849, he purchased a 100 acre parcel of land from Robert Tom who had owned the property since 1839. John Starkey married Margaret Murray and they had five children. In 1894, John Starkey's only son, James, born in 1858, took over the farm. James also bought an adjoining 100 acres, known then as the James Winyard Farm. James Starkey was married in 1901 to Grace Paddock. The couple had three children: Richard Murray Starkey, born in January 1903; James Jr. McPhatter born in December 1903; and a daughter Margaret Alice born in June 1905. James Sr. had an interest in breeding carriage horses, mainly for the American market. He exhibited his horses in Toronto, as well as at other shows. He was very successful and one of his horses took 52 prizes and 3 diplomas. 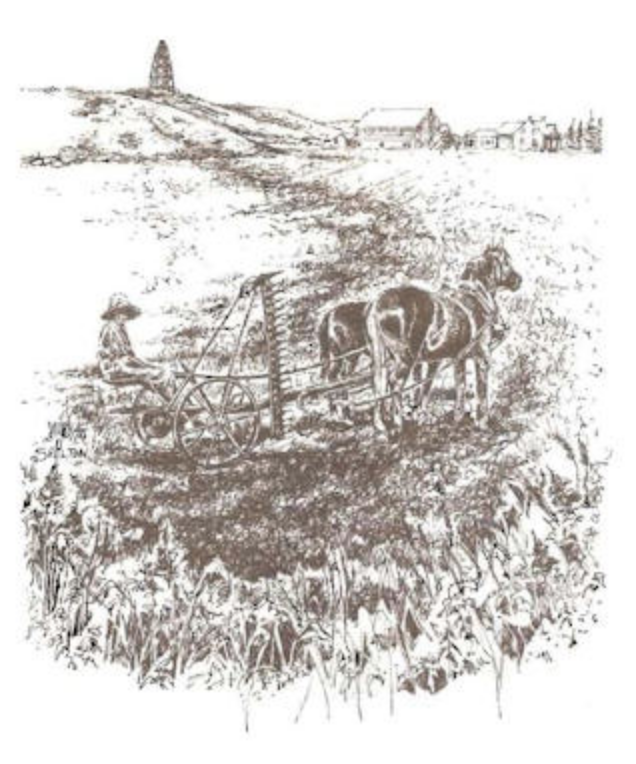 Death of James Sr in 1911 left Grace and the three children, then aged 8, 7, and 5, to run the farm alone. Grace passed away in 1930, leaving the three children to look after the farm. The farm by this time was known as the Starkey Bros. farm. In 1939, Margaret married Burton Terry and left the farm, moving to Clarkson Ontario. Both Richard and James Jr. were well known for their love of steam engines. They had quite a collection and often the neighbours would come to watch the engines run. In 1943, Richard married Margaret Hales and they continued to operate the farm along with their brother James, until its sale to the GRCA in 1972. James Jr. was married in 1958 to Grace Stewart. James and Grace moved into the village of Arkell and built a house of their own. James Jr. was reeve of the Puslinch Township Council in 1950. He was a member of the council for the years 1947, 1948,1949, and 1956. He also served as a trustee of the Arkell school in 1962.